Nowadays wearable body sensors are widely used for monitoring the physiological signs of the human body. A Wireless Body Area Network (WBAN) usually consists of a single coordinator and multiple computational constraint body sensors. In WBANs, mitigation of interference is an important issue to improve the network throughput. Interference occurs when multiple WBANs come within the proximity of each other, and every one wants to send their data at the same time. 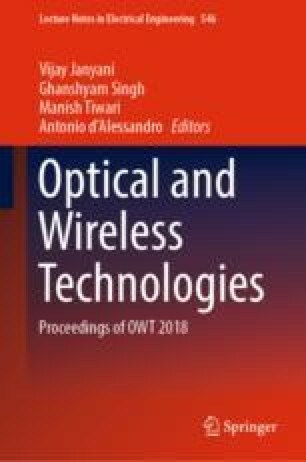 In this paper, we mainly focus on interference minimization for coexisting WBANs. The main objective is to schedule all nodes in the network in an interference free manner so that the spatial reuse factor is improved. We use both Protocol and Physical interference model to capture the interference at a WBAN. Moreover, a Delay-Aware Priority-based Scheduling algorithm (abbreviate shortly as DAP) is proposed where the priority of nodes and interfering nodes are taken into account to schedule the body sensors. Simulations are performed in different network scenarios and compared with ID, degree and ITLS based scheduling. The simulation results show that the priority based scheduling has better performance than ID, degree, and ITLS-based scheduling algorithm. The first author wishes to thank the Director, National Institute of Technology, Durgapur, India for providing the facilities and support to carry out this work.